NEW ZEALAND’S NATIONAL Party was today found guilty of ripping off rapper Eminem’s song “Lose Yourself” in a 2014 election campaign commercial and ordered to pay more than NZ$600,000 (€351,476) in damages. National, which won the 2014 election but was tipped out of power last week following the latest ballot, was accused of breaching copyright by using a work entitled “Eminem Esque”. The Detroit rapper’s music publishers, Eight Mile Style and Martin Affiliated, launched proceedings in September 2014 arguing Eminem Esque was Lose Yourself under a different name. Five months after a two-week hearing in May, the New Zealand High Court found the National Party guilty. “Eight Mile Style is entitled to damages on a ‘user principle’ basis in the sum of NZ$600,000, with interest, from 28 June 2014,” the court said in a statement. 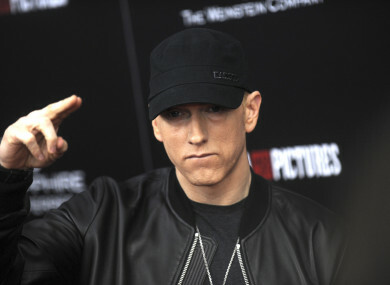 Eminem’s publishers argued the music was a rip-off of the rapper’s acclaimed Grammy and Academy Award-winning song Lose Yourself from the soundtrack of the 2002 movie “8 Mile”. National said the music may have been inspired by Eminem’s hit but was different. The party insisted it bought the music in good faith from a recognised supplier and was assured there was no risk of copyright infringement. In a statement issued after the ruling, National Party president Peter Goodfellow said they were considering the implications and “already have a claim against the suppliers and licensors of the track”. During the hearing, National’s lawyer Greg Arthur claimed the industry practice of making so-called “sound-alike” songs that were different enough to avoid copyright issues was well-established. But Eight Mile’s lawyer Gary Williams said the National Party infringed copyright by using the song, or a substantial reproduction of it. Williams described Lose Yourself as “without doubt the jewel in the crown of Eminem’s musical work”. “The licensing of the song has been extremely carefully controlled. Despite many requests, it has only rarely been licensed for advertising purposes,” he said. Email “New Zealand political party ordered to pay €351k to Eminem in copyright case”. Feedback on “New Zealand political party ordered to pay €351k to Eminem in copyright case”.